British nationality can be conferred to an individual and a certificate of naturalisation will be issued as evidence of this. The apostille may be required for this document as evidence of a persons nationality. When the document has been checked and signature or stamp confirmed, a copy of the document will be solicitor certified and the apostille will be attached to the back of the document. 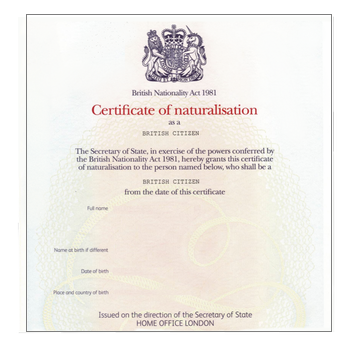 Legalising a certificate of naturalisation with the apostille is ONLY £66 per certificate on our 1-2 day service. It is not possible to issue the apostille to an original certificate of naturalisation. Altering the original document in any way would invalidate the certificate. A copy of the document should be certified by a UK solicitor or notary public to be eligible for the apostille. Get the document signed and certified by our solicitor. How to order an apostille for a certificate of naturalisation? Select the appropriate service from our online order page, print the order confirmation and post this to us with the originalk certificate of naturalisation certificate.